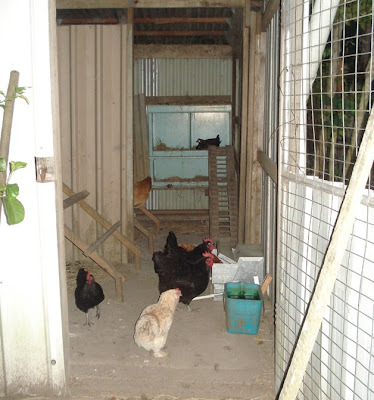 Just love this post sigh, oh I do wish I had chooks~! Oh for the life of you chooks. They are truly lucky birds to receive such thoughtful care. Oh what a sweet look at your chooks lives. You are such a wonderful chicken momma! I am sad today, because my daughter didn't get the wire tied down tight enough on my chickens coop last night and the danged racoons got in to them. I only had two, one was just a hang out chicken but the bigger one was giving me an egg about every other day. I will miss them. I told my kids, no more chickens until we have built a fortress for them to live in at night, I don't want any more heart break! Hello Rhonda Jean - that sounds like a nice treat for your hens. I should try it for my own. It has been very cold and wet here this week and the backyard is turning into a mud bath. I know the hen house needs a good clean out too, but it has been hard to find hay and straw around these parts this year. My hens are enjoying free range at the moment with there not being much in the garden they can't make too much damage. Hope you are having a nice weekend. I love the weekends because my husband is home for two days in a row! Aww, what we do for our loved pets! I'm currently sitting here with my 16 year old arthric dog next to the heater. He smells and sheds hair everywhere but his poor old bones just can't cope with being outside in the cold anymore and I can't bear the thought of him suffering, so I just have to put up with the mess, oh well! To be warm, dry and have a full belly....how blessed are we! My chickens are dealing with 115! We all warm and full bellies here. thats riches enough. one thing I have learnt over the last few years is thats to be safe in our beds and have a meal on the stove and blanket to warm we really need very little more. Love living vicariously through your blog. Someday we hope to buy a minifarm and live where we can have our own chicken. Till then (and probably long after), I have your blog to fill that emptiness. Keep em coming! This was a perfect post for today as my 3 yr old was asking for chicken photos. We're finishing up our garage sale today where we made just enough to build our coop for our first 6 chickens. Should be ready for their arrival in a month or so! So excited for these silly critters to join our little family. My hens are enjoying life too - especially Henrietta who is gorging on cherries. Inspired by your blog, I have spent some of today, cooking with cherries and baking with great results. Recipes, etc are on my post of today and includes a link to here. Please keep up the wonderful task of inspiring me! Rhonda, what do you do when a chicken is broody? do you just let it get on with it and wait until it gets over it? 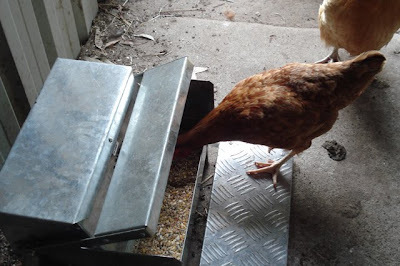 We have one broody right now and regularly lift it out when we go to check for eggs but not sure what else to do as it would be complicated to seperate it from the other birds and block access to the nest. It always goes back on the nest pretty quick. Broodie hens are funny and very cute. I love my chookies. Yours look very happy and I do like your feeder.